Regardless of whether your health care plan covers prescription drugs, you can still make informed choices to save money. No health insurance/prescription drug coverage? Not everyone has health insurance, and not everyone with health insurance has pharmaceutical coverage, but Washington residents can still purchase the prescription drugs they need through the Washington Prescription Drug Program. Shop around and compare prices. Prices can vary widely among pharmacies locally. And if you are comfortable using licensed mail order pharmacies, consider that option. Go generic. Ask your doctor if there are generic equivalents available. Many brand name drugs have equally safe and effective generic equivalents that can cost a fraction of what the brand name drug costs, and they are the chemically identical. If you need a brand name drug and can’t afford it, check with the drug manufacturer, your pharmacist, or your doctor. Many pharmaceutical companies have patient assistance programs to subsidize or freely provide medications to low-income, qualified patients. Check with organizations you belong to and see if they have arrangements for members to obtain drug discount cards. Understand your drug benefit so you will be better able to use it wisely. Talk to a representative in-person or by telephone. A drug formulary is a list of drugs which your plan will cover, or pay for, to some extent. 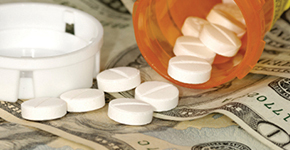 Not all drugs on a plan’s formulary are necessarily covered equally. The extent to which different drugs in the same class may be covered under your plan can vary widely. If a drug is not on the formulary whatsoever, that is if it is “off-formulary,” then it is usually not covered at all. Generally, drugs on a plan’s formulary are placed into one of three, or maybe four, categories or "tiers" by the plan for reimbursement purposes. The “most preferred” tier usually provides the highest insurance coverage and requires the smallest co-pay. For example, a drug in this most preferred tier might require only a small co-pay or perhaps no co-pay at all. Generics are usually in this tier, but sometimes plans also include a few patented, brand name drugs, too. By making this level or tier the least costly in terms of co-pays for consumers, health insurance plans hope through market incentives to drive consumers to those drugs instead of more costly alternatives. The next level down for reimbursement purposes is usually a limited number of brand name, patented drugs. Not all brand name, patented drugs in a therapy class will be included at this level. For example, if there are six brand name drugs available to treat a condition, one or two or three of the brands might be selected. Although the consumer’s co-pay for this tier of drugs will be higher than the most preferred level, it is better than the next level down. The reasons surrounding formulary development and tier rankings are complicated, but suffice it to say that when one of several equally beneficial drugs (on average for the population as a whole) is as medically effective as another, then the price of one drug relative to another in that class becomes very important, competition for customers increases and price negotiations involving drug companies and health care plans occur, pricing deals are cut, and some brand name drugs get selected over others because they are then equally good but less expensive and more cost-effective. The lowest tier is usually made up of the brand name, patented drugs which were not selected to be preferred. Even so, many plans still provide some coverage for drugs in this tier, so they are still considered to be on-formulary, albeit in a non-preferred position. But now the health insurance coverage is less and the consumer’s co-pay is even higher. In addition to understanding your formulary and its tiers, check to see if there is a mail order pharmacy option available through your plan. Often, mail order pharmacies are less expensive for the plan, and the plan may pass along some of the saving to consumers in the form of lower co-pays to induce use. Some people are comfortable with using mail order pharmacies, especially for chronic use medicines. If you are Medicare eligible, consider Medicare Part D. Be sure you understand how it operates in conjunction with any other pharmaceutical coverage you might have. If you are taking more than one medication, make sure your doctors and your pharmacists know everything you are taking. Medicines can interact with each other and rob you of your medication’s benefits or even hurt you. To learn how to get the most out of your prescriptions and your prescription dollar, AARP has helpful advice and a drug savings tool. The Office of the Insurance Commissioner has a toll-free number to help you with questions about health insurance. For more information, call 1-800-562-6900. Their site also offers a lot of consumer health care coverage information, including information for Paying for Prescription Drugs.